I frequently purchase scrapbook made by fans. I recently obtained one from someone who was obviously a George fan. The unfortunate thing about scrapbooks is that you don't always get all of the information because it is just literally a scrap of paper glued in a book. This is a great story, but I have no idea who is telling it. George Harrison (yes, himself) was in Los Angeles for almost a month in late October/early November recording Jackie Lomax's new album for Apple. 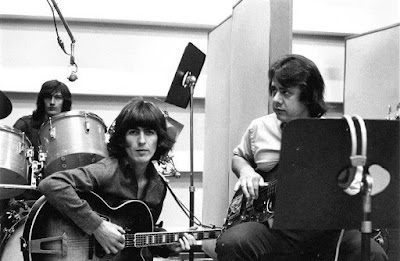 George managed to find the best (and most well-known) studio musicians in town: Hal Blaine on drums, Joe Osborn on bass, and Larry Knechtel on piano/organ. The Blossoms (a girl trio, remember them for Shindig?) sang some background vocals, and Jackie played guitar, sang and wrote the songs, which are quite good. This may sound like sacrilege, but I liked Jackie's songs better than some of the new Beatle songs. Must relate on incident: by some great stroke of fortune I was present at a Harrison-Lomax session (don't ask how, it's too complicated) when two young men came in, one armed with a guitar case. "It's a new guitar we've designed," explained the young man. "Fine," said George, "do you want to give it to me?" "Well, er, ah....it's the only one...we just wanted your comments...." "Oh," said George and promptly plugged into an amplifier. While he was puttering with the guitar the amplifier picked up a local radio station which was playing "Hey Jude." George started strumming and humming along, and we all looked at each other and flashed and smiled and felt good. So GH finally got to strum guitar to Hey Jude the way he wanted to in first place when PM wouldn't let him! Almost instant karma. glad you got this scrapbook! It doesn't seem to be from a magazine, but from a newspaper or a magazine that printed on newsprint.